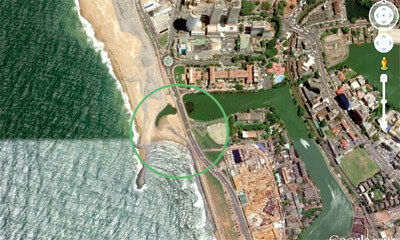 A narrow focus on the Colombo Port City’s recently released Supplementary Environmental Impact Assessment (SEIA) risks distracting the public’s attention from other related consequences of the proposed development, engineers who studied the report said this week. Meanwhile, transport experts warned that the developers of the Port City Project must do a Traffic Impact Assessment (TIA) as early as possible and set out an “action plan” on how they hope to provide for the increased vehicle movements that are likely to come up around the Fort area. “The TIA is to be done during the EIA Phase II,” observed Amal Kumarage, Senior Professor, Department of Transport & Logistics of the University of Moratuwa. 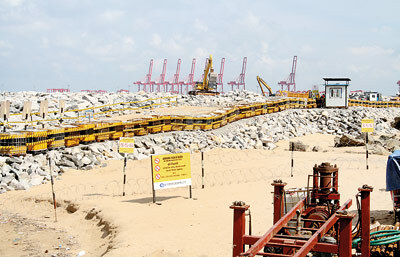 The SEIA of the Colombo Port City is still open for public review and comment. It may be accessed at one of eleven locations — including the Coast Conservation Department and Coastal Resources Management Department (CC & CRMD), the Ministry of Mahaweli Development and Environment and Central Environmental Authority — until December 30, 2015. A fresh EIA was required as the earlier report and an addendum were found by a Review Committee appointed by Prime Minister Ranil Wickremesinghe to be incomplete. A development permit granted by the CC & CRMD was provisional with a large number of conditions attached to it. The previous EIA did not address the impacts of the utilisation of reclaimed land. The developers had limited their report to the impacts of dredging and land reclamation. This meant the EIA had not complied with the Terms of Reference (TOR) issued by the project approving agency. “Basically, there was no valid permit to proceed with the project, considering the conditions stated in each of the approvals,” a Committee member said, requesting anonymity. The SEIA was meant to address many of these gaps. The Committee also concluded that the developers had started the project without a proper feasibility study and without an approved land use plan. While the developers repeatedly claimed that such a study was available, it was never released. What was available was a report on the commercial viability of the project from the perspectives of the investor. The Colombo Port City’s boundaries continuously expanded. It now rests at 269 hectares (up from 200 hectares). The Prime Minister’s Review Committee recommended that a complete EIA be carried out, addressing dredging, land reclamation and land use. However, the SEIA addresses only dredging and reclamation. It does not look into what impacts the use of the reclaimed land will have on the environment. This will only be done at a later stage. “This endorses the pre-2015 scenario, where developers, on their own, decided not to include land use impacts on the EIA,” the Committee member said. The SEIA says the developers have submitted a draft land use plan to the UDA for approval. It does not explain why the impacts of land use are not included in the scope of the SEIA. “If this had been done, as is required in the case of mega development of this scale, land use impacts could be identified at an early stage and remedial action incorporated to mitigate them” he explained. At present, the impacts of solid and liquid waste generated from the project, provision of water and other utilities to the project, and impacts of the traffic on the existing road network are not known. Sri Lanka is completely unaware of the consequences it will face when Colombo Port City comes into operation. “Colombo city currently attracts around half a million work trips and two hundred thousand school trips,” said Prof. Kumarage. “There is twice that many trips for all other purposes, amounting to over 1.6 million movements. Over 70 percent of these are made by some form of private vehicle. Half of these trips are generated from within Colombo while the other half arrive from outside. “The SEIA says the relevant Government agencies are responsible for providing the required transport and traffic capacity outside the project,” he continued. There are questions over why the new report has been described as “Supplementary”. The decision of both the Prime Minister’s Review Committee and a separate Ministry Secretarial Committee had been that a fresh EIA must be conducted. The use of the word ’Supplementary’ implies that there is a valid and complete EIA Report in place, and supplementary report was required to address minor changes to the original development plans. Meanwhile, the Concession Agreement states that the Government is responsible for providing all service utilities — including water, power, sewage and solid waste disposal, telecommunications — required for the operation of the Colombo Port City. But it does not state the extent of requirement of these facilities. It could be assumed that between 75 and 85 million cubic metres of sand will be required. The commercial value of this sand, including royalty fees, would be US$ 1.5 billion. This is more than the investment claimed to be made by the developer which is US$ 1.35 billion. However, the sand is to be given free to the developers. The seabed area also belongs to the Sri Lanka and there is an opportunity cost incurred by the Government for allowing the Port City development in the said land, foregoing the opportunity of using that location for any other commercial value. It is doubtful that these factors were considered in deciding the allocated Government share of the Port City. 1. Uni-Consultants, University of Moratuwa and GSMB (Geological Survey and Mines Bureau) Technical Services are consultants to the Supplementary Environmental Impact Assessment (SEIA). Ironically, the University of Moratuwa and the GSMB are members of the Technical Evaluation Committee (TEC) that reviews the report. The National Aquatic Resources Agency (NARA) is involved with developers in preparing the SEIA. The same organisation is included in the TEC. This raises questions of conflicts of interest. It could be said that the developers drew these organisations into their pay list (by getting consultancy services) so that approval of the report would not difficult. 2. There is no Traffic Impact Assessment for the transport of quarry material along the roads. It is said that a similar quantity was transported for the South Port Construction without much traffic congestion. This is factually incorrect. Only the aggregates and some small rocks (sourced from Kaduwela area) were transported by road for South Port. The major portion — large rock armours — was taken through sea in barges after loading at a jetty in Wadduwa. 3. Eleven quarries are identified for procurement of rocks. Eight are along the Kaduwella- Hanwella route. Six transport routes are identified: four are merging at Kaduwela junction and continuing towards Orugodawatte on the same route. This route will bear the transport material of eight quarries. This could cause massive congestion from Kaduwela towards Orugodawatte via Wellampitiya. It is proposed to deploy 400 larger trucks, each truck making two trips per day throughout the project period. This could have serious consequences for those who regularly use this route. 4. No traffic impact assessment (TIA) had beenundertaken for the operational face of the project, reason being that present report does not cover the operational phase. 5. To address the impact of dispersion of Beira Lake discharge, a comparatively low pollutant load (of 0.07 kg/ m3) has been considered. The assumption is that under the Concession Agreement the Government of Sri Lanka will stop illegal waste discharges into the Beira Lake, thereby making the degree of pollution in the Beira Lake marginal. This is subjective and needs serious discussion. For instance, if the Government does not fulfill its commitment on time, what would be the impact? 6. The blockage of the Beira Lake outfall due to the Port City construction (particularly, the proposed Marina in the Port City) is not taken seriously, and not addressed adequately in the EIA. It states there will be no serious impact. If this blockage is not addressed, the flooding of the Colombo Business District (CBD) would be eminent in case of heavy rains. Even at present, with the partial construction of the Marina, the blockage of the Beira outfall can be seen. The numerical modeling has been inadequate to identify this effect. 7. The report fails to identify the sand blockage at the Beira outfall but contradictorily proposes to construct a submerged groyne to mitigate the impacts. 8. The SEA states that the project envisages the reclamation of an area “not less than 269 ha…” This implies that, if the SEIA is approved, it would give the developer a blanket clearance for reclaiming an area in excess of 269 ha if needed. 9. As per the current SEIA, the sand volume required for the reclamation has been assessed as 65 million cubic meters, and no substantiating document is cited as proof in the report. It is not clear whether the stated quantity is the balance volume required to complete the project, excluding the 11-13 million cubic meters of sand reclamation done prior to the project’s suspension.